I’m trying to think when the last new church was built in downtown Raleigh? There may be quite a gap between that one and the one being constructed now on Peace Street next to the AIA NC building. Holy Trinity Anglican is currently located at the house on the corner of Peace and Blount Street next to the church construction site. The building should be finished by September 2015. There’s a nice virtual tour video, embedded below, or on Vimeo. I wish other new developments would release videos like these. Take the Tour from David Cumbie on Vimeo. If done right, the building should appear as if it has been there for a century or more. If done wrong, it will look like every other bad rendition of mimic architecture. I sure hope that the detailing is done without compromise and that it doesn’t look like a watered-down Georgian replica that one can find at Epcot. I fear that it will…. The key will be in the windows. Divided light windows are such a strong element in Georgian design and truly divided light windows are such a strong design characteristic. I fear that the windows will be other late model examples with fake divided lights sandwiched within the insulated glass cavity. For me, this just kills the charm and the delightful way that light plays off the individual panes. Oh well….maybe I’ll be proven wrong. While this design doesn’t have the true symmetry of classical Georgian architecture, its asymmetry is balanced and its massings are fairly pleasing. Because of this, it comes off as less imposing and more friendly. That’s a good thing IMO, even though I am not a fan of continually rehashing the same ole, same ole. Oops! I put my latest comment in the previous thread about this church. Sorry. John, you want this post where? Not sure I really get what they’re going for here. An old church that looks like an old church in an area that’s just getting younger and more progressive. Not that I’m against a church being built, but I guess I’m confused on the market they’re going for. It seems as if today’s Christians are less about the building of the church and more about the community and the outreach. Most I’ve seen that have taken off in other cities (or even around here) are small groups operating out of old warehouses, or even high school gymnasiums. Is this just a delusional christian who thinks that the reason the younger generation is turning from religion is because the churches just aren’t big enough anymore or there aren’t enough to serve the population? Just want to echo Leo’s comment regarding the virtual tour provided along with the design of this church – “I wish other new developments would release videos like these”, and up the ante. I understand that the architectural design for a new structure can be a fluid process, and that these are essentially “private”, not “public” projects. Nonetheless, there should be a clearly-defined sequence of informational benchmarks built into (pun!) the city government’s design approval process. And those benchmarks should include MANDATORY virtual walk-arounds of a new structure, and also mandatory NEW virtual walk-arounds every time the design is altered for any reason. In a modern era where CAM software is every bit as common as word processing software, there is no reason why in-motion virtual walk-arounds should be unavailable to the public on large urban projects. Instead, we are always left guessing about numerous design details, including how the new structure will fit into our community. My point is: if a design firm can’t or won’t provide a virtual walk-around, then either a) they have something to hide, or b) they’re not ready for the big leagues, or c) both. BTW, a virtual in-motion walk-around of the Union Station project would be especially helpful. Lou – fine, I’ll say it then. 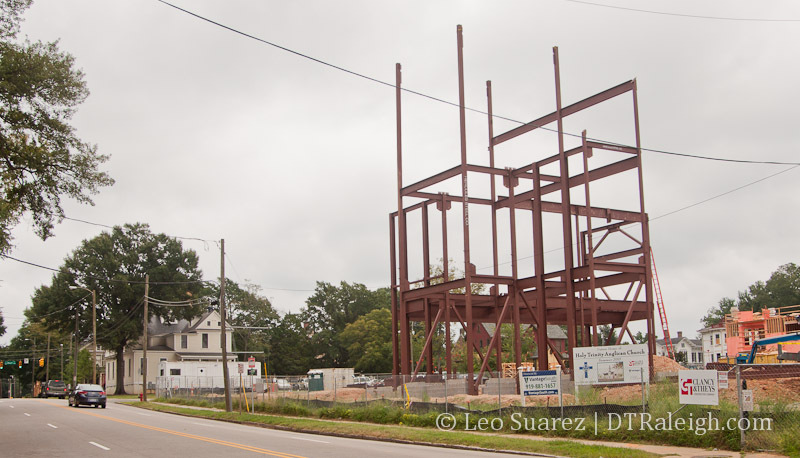 I am against a church being built, in downtown Raleigh at least. There are already an OVERabundance of churches in the heart of the city. Getting sick of it- make room for development that’s actually going to increase tourism, business startups, retail openings, and living space. You know, things that will actually improve the city. And just as Lou stated, I’m not hating on god; that has nothing to do with it. Normally, I’m against modern churches in downtown areas because of the lack of activity 6 days a week and large parking lots. However, this seems to be executed well. I pass by this site on the way to Retro Fitness every day and I’m impressed with the overall site layout. Hopefully, the architecture isn’t value engineered and is true to the renderings. @Jake: At least it doesn’t appear to be a “Westboro Baptist model” type church that will embarrass the city. This is about as mainstream as one is going to get. That said, I think I’d rather have a grocery store in that location than another church that will be used only a few times a week and only by a selection of people that I doubt will be living in large quantities downtown. Ugh…that means more parking lots. I won’t go as far as to say that context for this church was ignored but the video shows the church as if it were in the middle of flat grasslands or farmland. I was blown away at how voluminous this thing really is inside. I don’t go to Church. I don’t want to argue any type of religious point becuase I have none. I will say there could be a hell of a lot worse things built in DT Raleigh other than a church. I hope that it turns out nice, looks good, and offers something to people in DT that would not normally spend time DT. should have been a grocery store. Just saying! Wow, really looking forward to seeing the inside of the finished product. The videos would help with learning more about other projects as well. I agree with Bob on all counts. I’d love a grocery store downtown, but that location wouldn’t have worked due to the very close proximity of Harris Teeter, access issues, and the associated parking needed. In the past, I’ve heard from many land brokers/market analyst that CV Harris Teeter is the main reason a grocery store hasn’t ventured into downtown. However, I’m now hearing there is finally excess demand as of now, so I wouldn’t be surprised to see one in the not too distant future. Basically, people in Sky House or Edison Apartments won’t want to venture to Cameron Village for groceries. Publix announced a while ago that they were actually bringing one downtown, but I haven’t heard anything since. Grocery stores are across the street from each other I don’t think Harris Teeter can handle the increased traffic soon to be delivered by the two new apartments next to them. 616 Oberlin will be starting soon too. I bet once one grocery store opens downtown then another will jump at it too. They don’t have to be 50,000 feet, whole foods slams it on Wade with less than 25,000. They won’t open DTR since they don’t open within 12 miles of another WF. A small grocery store would be slammed. I’m completely turned off of Fresh Market, and I go to Whole Foods almost daily. Seems like higher prices for less selection, but maybe that’s because the CV one is so small. I think the smartest thing Publix could do if they want to enter our market (besides argue with NIMBYs in N Raleigh) is to put a North Hills Harris Teeter style store downtown. No one would oppose it like in the suburbs. It would also get a ton of recognition from the media, social media, events with suburban visitors, and just the cool factor. Not to mention there would be almost no competition for awhile. Yeah it doesn’t really matter if other places build grocery stores across the street from each other. What matters is customer base and trade areas. For a very long time, Cameron Village Harris Teeter has acted like a sponge soaking up all of the demand in the CBD. However, the newest residential projects have pushed demand past the sweet spot, so I’d expect a smaller grocery store to locate downtown soonish. The warehouse district would be the perfect place for a grocery store. The majority of that area looks like crap anyways. It really doesn’t get much traffic and it would really help bring some life into the area. Maybe after club Bodi, finally closes they can put one in that building. There’s already a parking lot beside it. I don’t know if there’s really enough residents in that area to warrant a grocery store. It does have a couple of large warehouses that have the room for one, but most downtown residents live either on fayetville st or east of it. Also, we have three large complexes being built right around moore square. I think that would be the best location for one. Hopefully at the bottom of Edison Apartments. I think one of the problems with a grocery store in say the Edison Apartments would be parking to grocery store access. Unless Edison Apartments were designed with that space in mind, I don’t think you can just plop a grocer in with a parking deck nearby and expect magic to happen. NHE Harris Teeter is actually very well thought out as far as the parking to store access experience is concerned. Perhaps the Edison developer can modify one of the retail spaces to accommodate a street level entrance AND a parking deck entrance. Downtown’s population can’t support a non-vehicular grocery store just yet. I am glad to see a church being built on that side of downtown… a church does underline the concept of community… thus it is a great idea! As far as a grocery store, I have pondered upon the downtown maps… and see the biggest prospect close to the warehouse district. The location would be between S West Street, W Morgan Street, and Hillsborough Street. This location is located at a more central area between most of the new apartments (those that are built and those that are in the construction phase)! This land will also house new rail access to the back of the property! New grocery stores within downtown areas being built these days tend to also have parking decks either above or below the actual store. We need churches and grocery stores… both support the idea of community… which supports the idea of positive growth. Oh fun. Thanks for sharing.